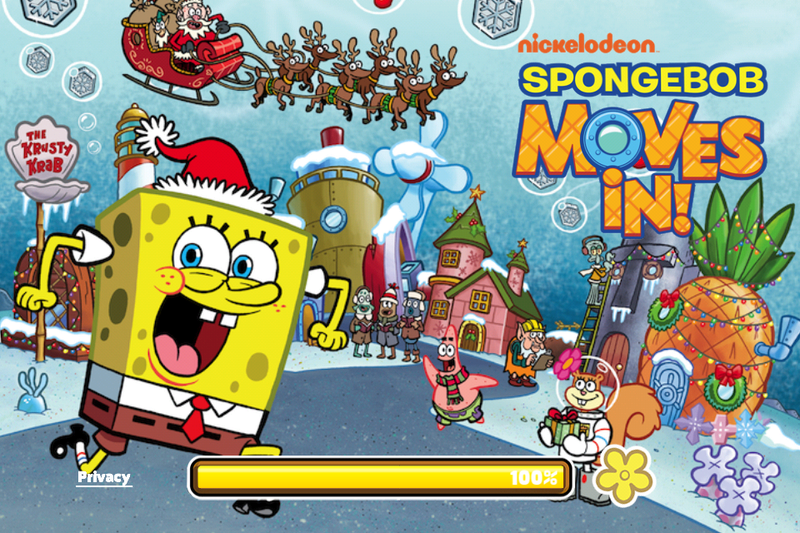 Holidays 2013 - The SpongeBob Moves In Guide Site! On December 4th, Nickelodeon pushed Version 3.07.00 to players, bringing to us a whole new event! So, what's up? Well, winter has arrived in Bikini Bottom and SpongeBob has kindly invited Santa's elves to stay in Bikini Bottom to help meet toy production quotas for the Holidays! 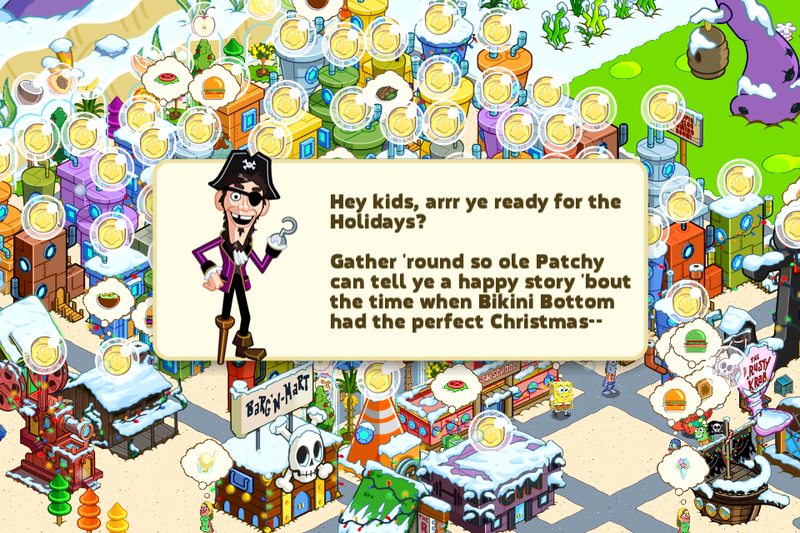 Patchy and Potty tell the classic tale of Christmas, with relation to episode 175, "It's a SpongeBob Christmas"! Unfortunately, there wasn't any stop-motion character designs. Either ways, SpongeBob needs your help to spread holiday cheer! 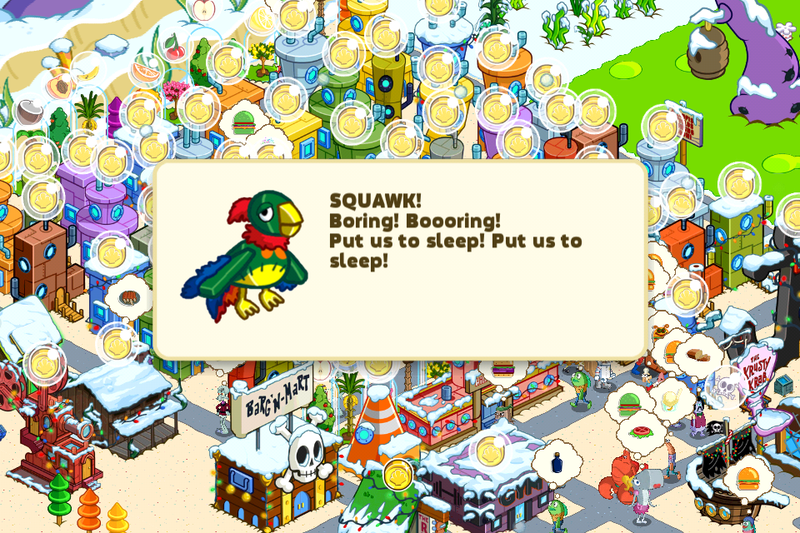 Feed bottomites Holiday Treats and unlock limited-time only decorations! Not forgetting the various new buildings you get to Move In! Will SpongeBob and his friends be able so save Christmas from a certain one-eyed fella and his Jerktonium-laced fruitcake? The answer is yes! Check Out All the Great Stuff that happened in "SpongeBob Moves In" in December 2013 below! Patchy and Potty serve as narrators in this holiday special, and they don't really get along well through out the story. Anyways, the main storyline of this event is that of "It's a SpongeBob Christmas", SpongeBob's First-Ever Fully Stop-Motion Animated Episode. Even the Patchy introduction seen in the episode has been adapted into text! Pretty cool indeed. Follow along with Patchy's story and we'll dive deeper into Santa's Troubles, which we've highlighted below. At the end of the even, Patchy also has a closing to the story, which also is similar to that in the TV episode. Happy Holidays!